3 Bedroom Detached Bungalow For Sale in Leicester for Offers in the region of £425,000. 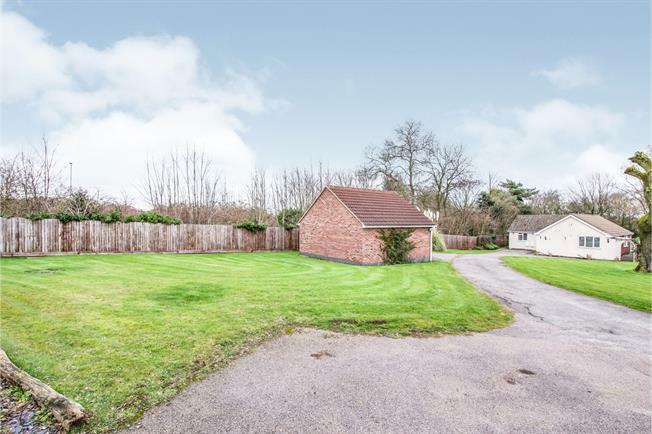 This detached bungalow must be viewed to fully appreciate the sheer size of it's plot it is situated on. Externally to the front is a elongated driveway which leads down to the bungalow whilst passing the detached double garage and lawn gardens. To the rear is a substantial mature plot which is mainly laid to lawn and consists of trees, shrubs, plants and a patio area. The nicely sized accommodation in brief comprises of an entrance porch, hallway, three bedrooms, a spacious lounge/diner, bathroom and fitted kitchen. The property has been modernised internally to a high standard giving it a classy feel and in our opinion is ready to move into. Finally the property could offer potential for extending on subject to planning permission/ building regulations being obtained by the local council and we strongly recommend you check this. UPVC front door. Double glazed uPVC window. Radiator, carpeted flooring, built-in storage cupboard. Airing cupboard with Worcester combination boiler. Access to the loft which could be good for storage. Envirovent silent 100 extractor fan. Double glazed uPVC window with obscure glass. Under floor heating and heated towel rail, tiled flooring. Low level WC, shower over bath, wash hand basin with built-in storage cupboard. Envirovent silent 100 extractor fan. UPVC sliding patio double glazed door. Double glazed uPVC windows. Radiators, carpeted flooring. Envirovent silent 100 extractor fan. Double glazed uPVC window overlooking the garden. Radiator, carpeted flooring. UPVC side double glazed door. Double glazed uPVC window facing the front. Laminate flooring. Granite work surface, corner wall and base units, butler style sink, integrated, electric grill and gas oven. Integrated microwave, stainless steel extractor, integrated dishwasher, integrated washing machine and fridge/freezer. Electric plinth heater. Up and over garage door, to the front of the plot.